Hello again, this is Shusei Tomonaga from the Analysis Center. Event log analysis is a key element in security incident investigation. If a network is managed by Active Directory (hereafter, AD), can be identified by analysing AD event logs. For such investigation, it is quite difficult to conduct detailed analysis in AD event viewer; it is rather common to export the logs to text format or import them into SIEM/log management system. However, since the amount of event logs can be massive depending on the environment, this can be a struggle for analysts. JPCERT/CC has developed and released a tool “LogonTracer” which supports such event log analysis. This entry introduces how it works and how to launch it. LogonTracer associates a host name (or an IP address) and account name found in logon-related events and displays it as a graph. This way, it is possible to see in which account login attempt occurs and which host is used. Figure 1 is a graph created by LogonTracer, which shows the relations of some IP addresses and accounts. Here are the details of each node. An account (Red/Blue) that is connected to a host (Green) with a line shows that it is logged on using the host. 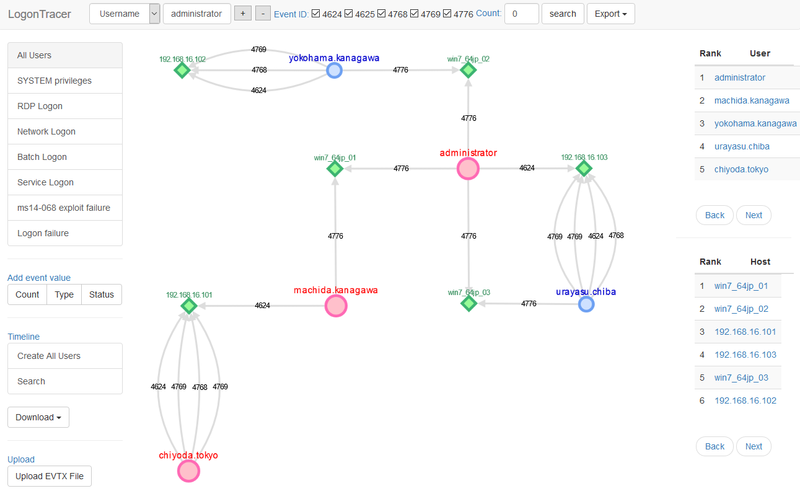 This visualisation makes the analysis simple even for those without detailed knowledge about event logs. 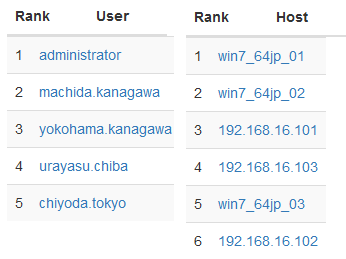 In addition to event log visualisation, LogonTracer is able to display possibly leveraged accounts/hosts by ranking. Figure 2 is an example of importance rank of accounts and hosts. For this ranking, LogonTracer performs network analysis on the event log graph, and creates a ranking based on the “centrality” of each node. Centrality is an index which indicates each node’s proximity to the centre in a network. For calculation of centrality, PageRank  is applied. In this algorithm, nodes that have connection to many other nodes are located towards the centre of the graph and therefore have a higher centrality. As compromised accounts are used to perform login attempts to many hosts, they tend to have a higher centrality. 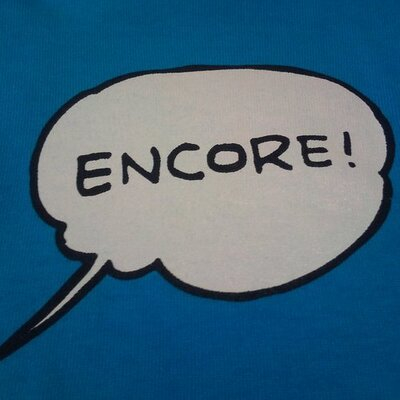 Consequently, by comparing the centrality, possibly affected accounts/hosts can be identified. With LogonTracer, it is also possible to display event logs in a chronological order. Figure 3 shows the number of event logs for each account in a time series. By checking the number of logs in the course of time, unauthorised logon attempts during a short period of time or outside of working hours can be spotted. Drastic increase of event logs is automatically highlighted. For detecting the increase of the count, Change Finder  is applied as an anomaly detection method. Here is the instruction on how to use LogonTracer. The tool was tested on a Linux environment. Download from the below webpage and deploy it in a folder. *If statsmodels installation fails, install numpy first. Launch Neo4j by GUI or command line. Below is an example of executing LogonTracer. To access the web interface, please go to the below URL from your browser. (In this environment, LogonTracer was installed in a local environment and runs on the port 8080). To import logs, you can upload in EVTX format. Docker image of LogOnTracer is available on Docker Hub. Because not all of the above event IDs are recorded with the default settings, Audit Policy needs to be enabled to retain such logs. We recommend enabling Audit Policy. For detailed instructions on the configuration, please see “Readme” of LogonTracer, which is also available on GitHub. Although event logs analysis is crucial in incident investigation, it can be a time-consuming process if you do not know what to analyse and where to begin. 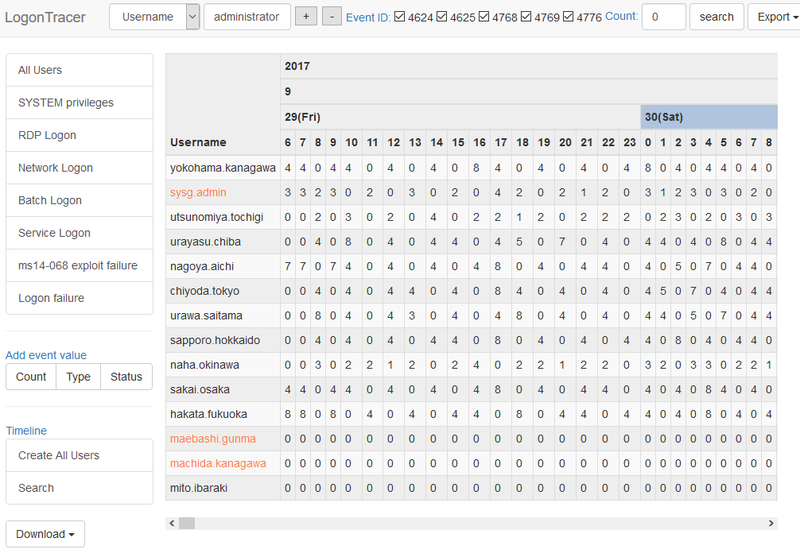 This tool offers easy event log analysis by visualising the relations among accounts and hosts. We hope that you try this tool in preparation to actual incident investigation. We will update soon with more information on how to conduct actual analysis using this tool. Multiple vulnerabilities were found in LogonTracer prior to v1.2.1. If you are using any of the old versions, please update to the latest version. We thank Shoji Baba, Kobe Digital Labo Inc for helping us to fix these issues.